Sweet Anthony was born on June 5, 2011, to proud parents Miguel and Yecenia. Immediately after birth, Anthony had complications with breathing and feeding. At 4-5 weeks old, Anthony started vomiting excessively. Beyond this, Anthony’s parents had noticed early that he didn’t seem to be tracking objects with his eyes. There was enough concern in all areas to warrant tests and evaluation. At 9 months old, tests revealed that little Anthony was missing the part of his brain called the corpus callosum. The corpus callosum is the band of white matter that connects and allows communication between the two hemispheres of the brain. One result of this is that Anthony’s optic nerve did not develop properly and he is now legally blind. Anthony also has cerebral palsy that challenges his mobility in all areas. Anthony cannot crawl, walk, speak, or feed himself. 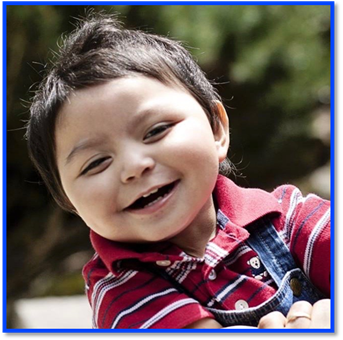 At around 1 year old, Anthony underwent surgery to install a feeding tube. In addition to this surgery, Anthony will most likely need a future surgery on one of his hip sockets, which is 50% out of place. Anthony receives many kinds of therapies. One therapy that this family has had to put on hold due to funding is the “Anat Baniel method.” This amazing therapy works to re-educate the brain through the use of nervous system. At one point, because of this therapy, Anthony was able to stand for the first time. Unfortunately, Anat Baniel therapy is considered “alternative,” so it is not covered by insurance. Anthony’s family is not deterred by this and will continue to do whatever they can to help their precious boy experience life in the fullest way he can. Anthony goes to school at Conger Elementary and loves music and enjoys listening to the noises of life all around him. Anthony will be adopted as a Sparrow to Mazama High School. Students at MHS will work hard to raise money for Anthony through sponsored community service and fundraising projects.